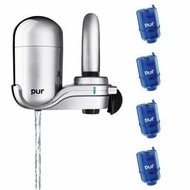 This product includes the PUR 3-Stage Vertical Faucet Mount in Chrome FM-3700B + 4 x Replacement Filters. The improved next generation of PUR faucet mounts is at your service. With a one-year warranty, high-quality construction, 1-click installation, and easy push-button removal, there's never been an easier or more reliable way to get PUR water. Each PUR MineralClearTM filter gives you 100 gallons of clean, healthy, great-tasting water. Product Features MineralClearTM filter filters water over natural minerals for a crisp, refreshing taste. Certified to reduce lead, chlorine (taste and odor), microbial cysts, and more. Easy push-button removal makes it easy to remove and replace when you need extra room in the sink. 360-degree swivel allows it to fit well in most sinks. Built-in electronic filter-life indicator tells you when the filter needs to be changed. High-quality construction: new finishes and materials stand up to tough kitchen use.